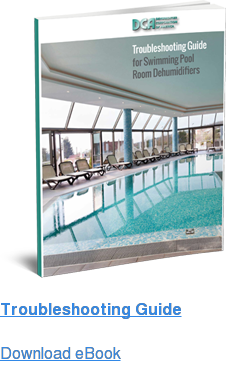 Commercial swimming pool rooms benefit from DCA dehumidifiers, as well as spa rooms in hotels, health clubs, YMCAs, YWCAs, high schools, universities, retirement communities, fitness centers and other facilities where high moisture build-up is a problem. The extensive use of typical commercial swimming pool rooms means more stringent requirements than residential pool rooms. DCA specifically designs and manufactures commercial dehumidifiers to address factors such as continuous blower operation, introducing code mandatory tempered outdoor make-up air, pool room exhaust fans and proper condensate rejection to floor drains among others. In small, humid rooms, such as ones with therapy pools, hot tubs or spas, a commercial dehumidifier removes all of the excess moisture. Additionally, because these rooms often have relatively small room volume relative to the moisture generated, they require specialty low-volume CFM commercial dehumidifiers to limit room air changes through the dehumidifier to an acceptable number. In the case of therapists or other personnel working in these environments, the dehumidification system must also maintain a specific working room air temperature. Health clubs not only require commercial dehumidifiers in swimming pool and spa rooms, but also in moisture-laden workout areas. Commercial dehumidifiers provide the moisture control needed to prevent fitness center air moisture problems such as mold and mildew formation, prevent workout equipment from rusting and preserve building integrity – functions beyond the capabilities of a typical A/C system. 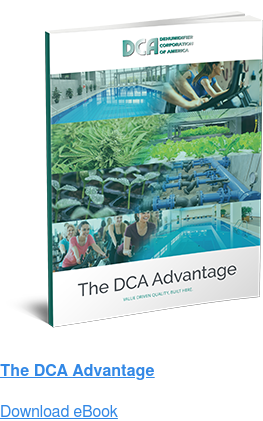 DCA offers water-cooled versions of every dehumidification system using sources including geothermal, cooling tower, chillers, processed water and city water. 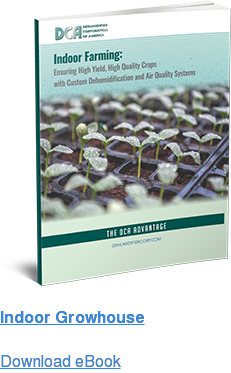 With DCA, you’ll get a factory-tested commercial dehumidifier every time, which ensures efficiency and capacity. Indoor pool humidity doesn’t have to be a costly, uncomfortable problem. Contact DCA to learn more about our commercial or custom dehumidification systems.